The U.S. economic recovery remains tepid, as can be seen from disappointingly slow first-quarter GDP growth and unexpectedly weak May job creation. And even after three rounds of quantitative easing and other “unconventional” monetary policy actions, inflation remains below the Federal Reserve’s two percent target. Against this backdrop of sluggish growth and low inflation, Federal Reserve officials have again postponed interest rate increases planned for the first half of 2016. But the Fed could do more to promote a robust expansion and move inflation back to target. Broad measures of the money supply have behaved quite erratically going all the way back to 2009. And since the first quarter of 2012, growth in the Divisia MZM measure of money we discuss below has declined from 9.3 to 5.7 percent. The Fed should act more consistently to stabilize growth in the money supply. By doing so, it would help stabilize economic growth and inflation as well. Those who doubt the effectiveness of monetary policy in the aftermath of the Great Recession often refer to the problem of a “liquidity trap.” As originally conceived by John Maynard Keynes, a liquidity trap occurs when increases in the money supply no longer lower the long-term rate of interest. If the effects of monetary policy get transmitted to spending and prices via changes in that long-term interest rate, monetary policy loses its effectiveness once a liquidity trap has taken hold. The modern version of this idea has shifted the focus to the inability of the Federal Reserve to reduce its federal funds rate target below zero. According to this view, the problem is not so much that the Fed has lost its ability to increase the money supply but, instead, that additional monetary expansion will no longer be effective because it fails to reduce interest rates any further. If the depression is very severe, enterprise will be killed. It is possible that no rate of interest, however low, will tempt dealers to buy goods. Even lending money without interest would not help if the borrower anticipated a loss on every conceivable use that he could make of the money. In that case the purchase of securities by the Central Bank, which is otherwise no more than a useful reinforcement of the low Bank rate, hastening the progress of revival, becomes an essential condition of the revival beginning at all. By buying securities the Central Bank creates money, which appears in the form of deposits credited to the banks whose customers have sold the securities. The banks can thus be flooded with idle money, and given a new and powerful inducement to find additional borrowers. Thus, whereas a liquidity trap accepts the idea that a central bank can increase the money supply but warns that doing so will no longer affect economic activity, a credit deadlock attributes low levels of aggregate spending to an inability or unwillingness of the central bank to increase the money supply in the first place. From this perspective, low interest rates are an indicator of weak economic activity rather than expansionary monetary policy, and escape from the credit deadlock requires that impediments to money growth be overcome. These contrasting views of the Keynesian liquidity trap versus the Hawtreyan credit deadlock are what lead us to ask what the behavior of money growth has been like in the U.S. The figure below plots the growth rate of Divisia MZM – “money, zero maturity” – an aggregate that includes assets immediately liquid to reserve as a means of payment. The shaded areas represent the three episodes of quantitative easing undertaken by the Federal Reserve in an effort to lower long-term interest rates while the federal funds rate has been at or near its zero lower bound. If the economy has been caught in a liquidity trap, one would expect to see lower long-term interest rates accompanied by rapid growth in the money supply. 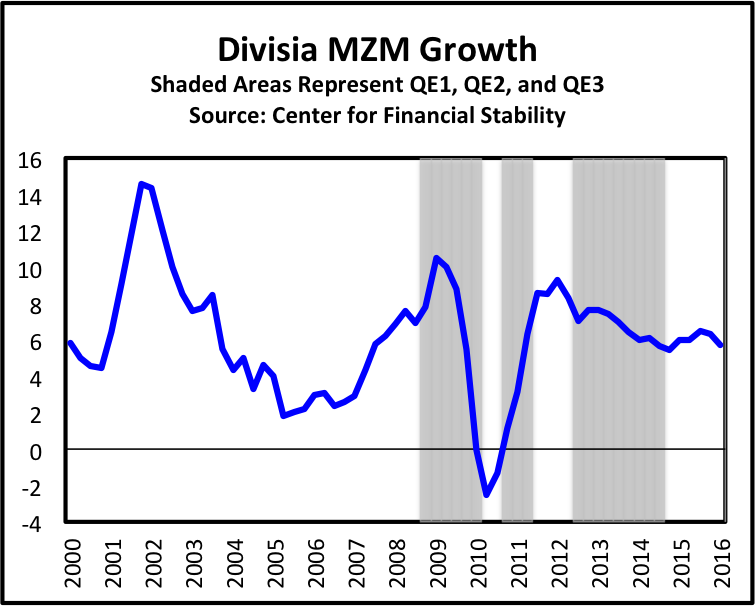 Instead, the growth rate of MZM declined sharply during most QE1, rose prior to and during QE2, and declined again during QE3. The lack of any consistent connection between policies called “quantitative easing” and acceleration in the rate of money growth points to a credit deadlock as the better description of the problem that hinders the U.S. recovery. 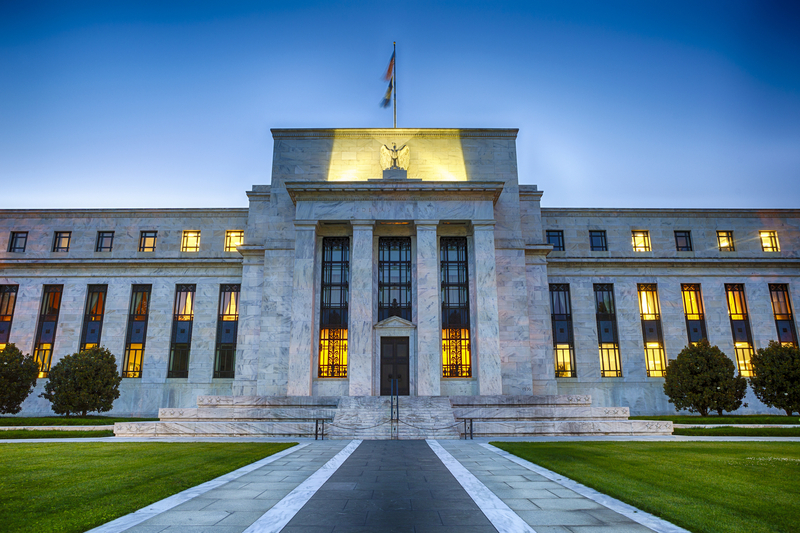 Thus, rather than doing more of the same by focusing only on keeping short and long-term interest rates low, the Fed may wish to try something different in order to better support the economic expansion and push inflation back to two percent. In particular, by shifting its efforts towards generating stable, sustained growth in broad measures of money, the Fed might break what appears to be a Hawtreyan credit deadlock and help get the economy moving again.